Kitchens can be very territorial spaces – especially in shared homes – so what better way to mark your culinary turf than by splashing out on a customised kitchen apron. Whether it’s for you or a loved one, these personalised kitchen aprons can include a name and a caption below, so you have plenty of space to be as creative with your clothing as you are with your cooking. “Queen of tarts?”, “Domestic goddess” or maybe you’re a “Masterchef”. You can get 18 characters for the name and 18 for the caption so get your thinking caps on (has anyone thought about personalised thinking caps yet?) before placing an order. 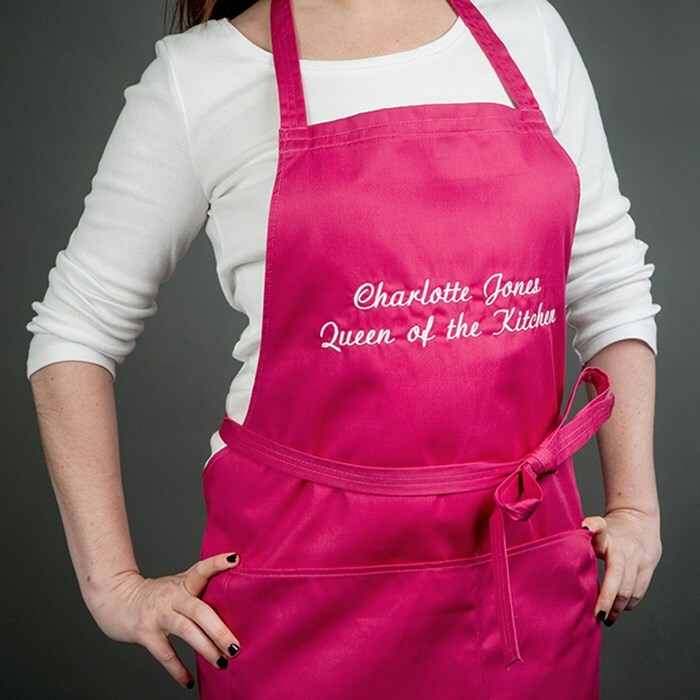 GettingPersonal.co.uk’s personalised apron costs £14.99 and is available in magenta with white lettering. An attractive presentation box can be added for an extra £5. For more colours, check our Spreadshirt.co.uk’s apron designer. The basic apron with bespoke lettering starts at £16.90, but as well as choosing different colours you can add icons and pictures to your personalised pinny. And what to wear under a personalised apron? Check out this personalised underwear that’s available, too.